This dashboard software is working on 28 currency pairs. It is based on 2 of our main indicators (Advanced Currency Strength 28 and Advanced Currency Impulse). It gives a great overview of the entire Forex market. 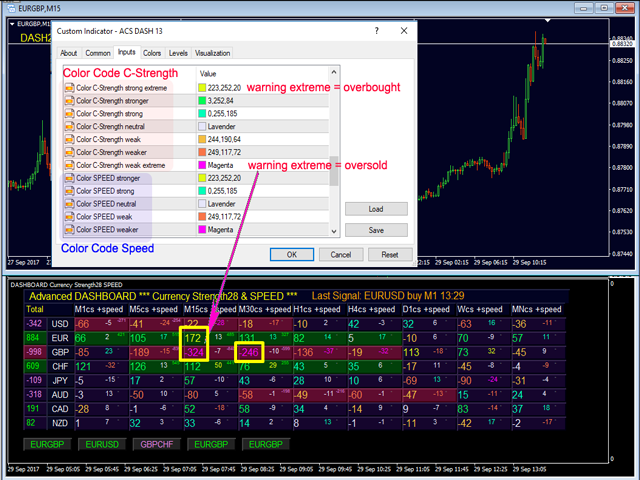 It shows Advanced Currency Strength values, currency speed of movement and signals for 28 Forex pairs in all (9) timeframes. Imagine how your trading will improve when you can watch the entire market using a single indicator on your chart to pinpoint trends and or scalping opportunities! We have built features into this indicator that make it even easier for you to identify strong and weak currencies, while identifying and confirm potential trades. This indicator shows graphically whether a currency's strength or weakness is increasing or decreasing and how it performs in all timeframes. Added new features are the dynamic Market Fibonacci Levels which adapt to current market conditions change, a proven plus already used in our Advanced Currency Strength 28 and Advanced Currency Impulse indicators. Always pair a weak and a strong currency when trading and this new indicator will help you do just that. Shows currency strength values of ACS28 and GAP-speed (Impulse) in each timeframe. Columns: the color codes show currency strength in 7 colors: strong extreme/stronger/strong/neutral/weak/weaker/weak extreme. Left Column: shows currency trend with a strength rating of all timeframes with a trend alert. 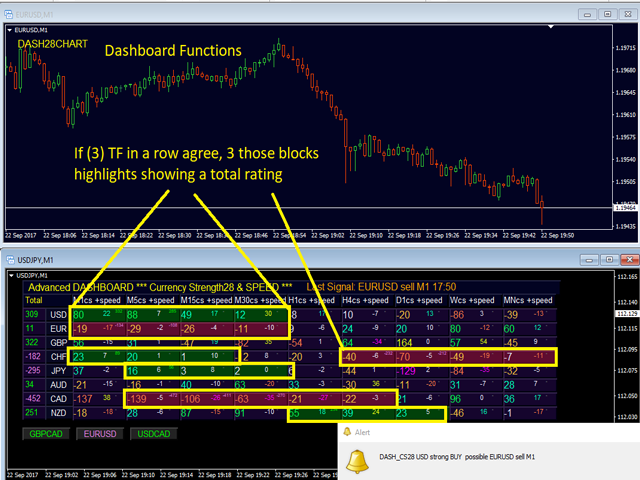 If 3 timeframes in a row agree, 3 those blocks are highlighted showing a total rating. 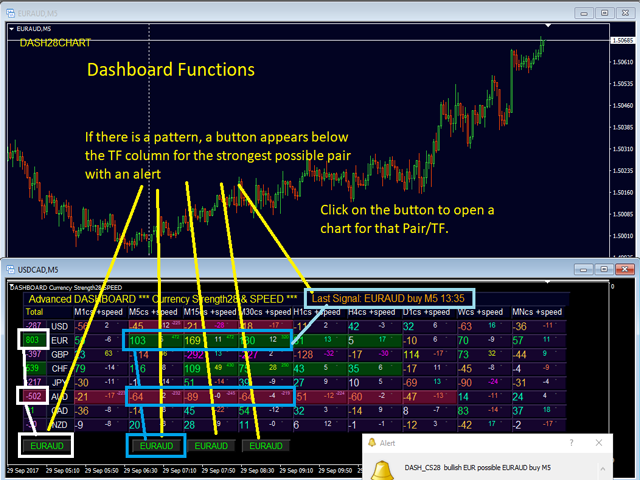 If there is a pattern, a button appears below the timeframe column for the strongest possible pair with an alert. Click on the button to open a chart for that pair/timeframe. Quick chart buttons: click 2 currency names to open any pair in a new window. 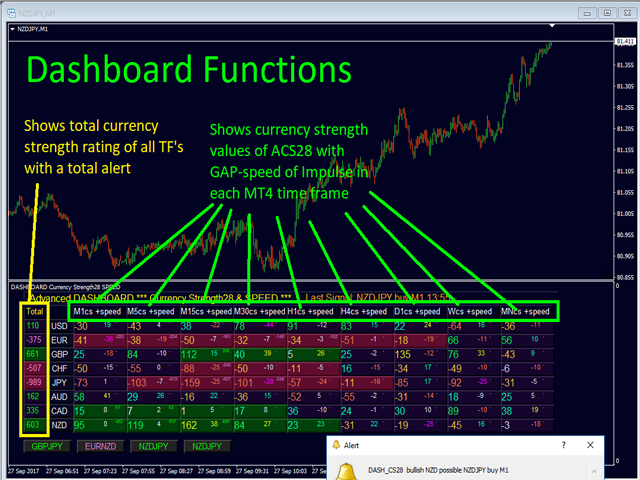 Auto update quote charts for all 28 pairs and timeframe will keep all MetaTrader 4 data current. Extreme Level M1... MN - Extreme Color Level Per timeframe. Alerted chart open in new window (default false) - Change the pair on same chart. Keep new charts in same window - New charts will apply in one same target window where you can add additional indicators. To change the pair on the target window, click the 2 currency names. Click 2 currencies build a pair. Example: Click GBP and JPY to change the chart to GBPJPY also the alert button will open in same target window or click on an alert button. DASH Trigger TREND (higher=stronger) - Minimum value for trigger trend alert. TREND chart open in timeframe. Alerts for M1... D1 Strength. Last Signal time is Local or broker time - Message on top with your computer time or broker time. Use of Simple Colors - Bear and Bulls. "true" - only 2 colors for positive and negative values will be used. Color C-Strength strong extreme/stronger/strong/neutral/weak/weaker/weak extreme - 7 Strength color codes. Color SPEED stronger/strong/neutral/weak/weaker - 5 Speed color codes. Panel DASH background Color NEUTRAL/BEAR/BULL - Signal color of highlighted blocks. Auto open of 7 support charts - Special: automated MetaTrader 4 history updates with background charts! These charts are for updating external currency quotes. Remove all indicators from such chart and keep it minimized. Run support charts all timeframes! - Update for all 28 pairs in all timeframes. Font spacing X/Y - Pixel correction for big monitors. Use my template and profiles (see the User Manual). Trade with the higher timeframe trend, trade weak against strong currencies and if the currency is extreme a color and speed it is inverted, check for a pullback trades. Study the complete trading system, read my news and blogs for trading system examples. I will always help you if you have any questions, just PM me for questions or to receive the latest information. May there be many green pips in your near future. Great dashboard! I started trading manually with the dashboard as my only indicator for a few weeks. I really like the accuracy of it, and after a few profitable weeks, I decided to automate my trading. So I developed an EA to execute my strategy, and now I don't even have to stay close to my computer anymore :-). Thank you very much Bernhard. "Advanced Dashboard for Currency Strength and Speed" is a very useful indicator that allows me to understand the current situation of the currency in a short time, so that I can make an accurate decision. Excellent overview of the market. This indicator is really good. It can detect the weak and strong currency in all 28 pairs. It also give alert witch is very useful. Well done. The dashboard gives a fantastic overview of what is happening in the forex market. It gives you both trend and activity level. Together they give a fantastic overview of the forex market, helped by MTF-functions, arrows, supply/demand etc. Dashboard indikatorn ger en mycket bra overblick over valutamarknaderna. Bade trend och aktivitetsnivan. 1 year rent($250) expired today, good reference to overall watch market. But it is not suit for day trading and overpriced compare to similar products like FXPOWER to buy($95). Great tool, an amazing addition to a trading arsenal! I am recently getting a high hit rate. A nice overview of the market currency strength. Still learning to use. i need to be more confident and now with 4 month more of learning and trials i realize that all i need is the 5 i bought some months before ! thanks a lot for that and the quality and pertinence of your tools. This tool gives you the global market view and you know where to go quickly, awesome ! best overview of the weak and strong currencies evr. Bernhard's support ist fast and excellent. Thank you! He is a strong and weak indicator. I have always used this indicator as a reference for strength and weakness, and it is very accurate! easy to use, easy to get profit. must have item !! This indicator summarizes Bernhards outstanding indicators strength and impulse in a way not seen before. You get a clear overview over the whole market with perfect entry criteria. Amazing work. Excellent Indicator and accurate. It offers the right insight to the trader in order to gain confidence and pips. It also trains the eye and the mind of the trader in order to get in touch with currencies he has usually never tried to touch. Bernhard keep up with the good work!!! Another quality release from Bernhard. I've been using his other indicators for some time now and I'm very happy with them. The dashboard in particular is a fantastic tool to quickly decipher what's happening in the market and identify possible trades. Bernhard's support is second to none. Always happy to give assistance and also add features at your request if they add something to the system. Looking forward to future updates and releases from all of his innovative trading tools. Update: The dashboard is most definitely worth the money. This can be applied to practically any strategy and you will see improved results. The way I use it is to follow the rules to the overall ASC28 strategy also applying basic price action rules which every trader should know then when I get a signal I use the dashboard to filter these signals before entering a trade. The overall trend strength number at the far left is extremely useful, as are the over bought and over sold extremes that are shown. If you're unsure about entering trades this can add a lot of clarity to the decision making process. For example you might only take a trade when there is a minimum difference between the overall trade strengths of say 500 or more (the more the better)... You can't make trading much easier than this! Been working with Bernhard's indicators for nearly one year, 3 months on real account. In Trendmarkets this thing is truly unbeatable. Know the markethours, know the setups, check all timeframes, eye on news, SL - enter! boom. Every signal bigger than M30 is insanely accurate. But be choosy. Supply or demand must be broken. Don't be scared, don't be greedy and everyting's gonna be alright #marley. EDIT: The strategic advantage comes into play by knowing when a currency is strong or weak comparing to the whole forex market. No other indicator can do this on fibo levels. If you believe trading is easy when you have the right indicator, buy some repainting or arrow-stuff and kill your account on the next volatility boost. If you want to become a serious daytrader at any market condition, do it the hard way. Your strategy for managing trades (SL, TP, etc), no matter on which timeframe is equally important. This indi is for traders, not for dreamers. Ps. shettytushar, don't let the frustration be part of your trading or reviews. I'm a customer/user like everyone else. I just hate trolls. Not worth it at all and waste of money. The signals are displayed when there is power in the trend which a free currency strength indicator would do as well. There are high chances of you entering in very late as well. I thought this could better my trading system but I was wrong, it is of no help at all. A free indicator does the same thing that this does. Never use this indicator as a standalone, it won't work. EDIT: You cannot become a day trader with this indicator, that is 100% for sure. The strength and weakness is displayed once a trend has taken momentum and hence I said you enter a trend quite late. And if you want to use this indicator for a trend continuation trade, then look for H4 and above timeframes, and you can't be a day trader using higher timeframes, as every candle is formed after it continues, pushes back and continues further. If you give a bad review the creator of the indicator will remove and block you from his ForexFactory forums even if you have purchased it. This guy doesn't just want to be acknowledge improvements and criticism. On top of that Sathomaso seems to be paid reviewer, who oftenly checks and reedits and tries to place his review on top of everyone else. This indicator is very useful and very fast, it's very good indicator to know the trend before trade, very good and fast support. Its Overprice and cant be just a Stand alone trading system !!. And yes the price moves away while you are just trying to confirm is it as per rules or not (( to many rules !! )) so what is the use off it &gt; its a nice indicator to give an overall picuter of the market . BUT the cost for me i regret buying it. Good product to predict which currencies to trade. Great indicator and should be used with Bernhard's other indicators to master your entries and exits. Support is excellent and I dont know of any message or question that has gone unanswered by him. Bernhard is not greedy and told me to go one by one on his indicators and one should start with currency strength and then impulse. Actually I have ALL of his indicators and cant do without them...keep up the good work. Yea, you guy just keep changing and delete my review. Great Indicator. It is strong weapon if you know how to use it. Bernhard is always very helpful and nice. Without a doubt 5 Stars ! Totally overpriced for the level of functionality.. It's kind of an ok product if you can read technicals and fundamentals and then combine it with these currency strenghts but as a stand-alone product it is close to useless..
Megaprodukt - Bernhard übertrifft sich selbst ! Wirklich klasse Erleichterung für jeden Trader, der nicht nur auf eine Währung fixiert ist. Auch das "Zusammenspiel" seiner Produkte ist genial gemacht. Ein Support, der vorbildlich ist rundet das Bild ab. Excellent product, lets you see the whole market in one dashboard. Quick email support and Bernhard even set me up via Teamviewer. Excellent stuff. This product is amazing. Once you learn how to forward think with this indicator, it offers unbelievable insight into the market. It is a work of art. I am very thankful. Keep up the good work!!! This is the best Market-Overview i have ever seen. We are ever in the right market now. The support is fast and very good. Thank you, dear Bernhard, for your good work! A new filter for alerts for the lower timeframes M1 M5 M15 added. A minimum speed of timeframe H4 will be checked to include a better trend. For scalping on the lower timeframes, we want to make sure of a speed in the higher timeframe H4 on both sides, which are the base and the quote currency H4 speed. A full block until H4 is not required. This will allow H4 inside-GAP. A new filter for alerts added. A minimum speed of timeframe-3 is extracted. We want to make sure the trend in the higher timeframe is strong on both sides, which are the base and the quote currency speed. New graphics feature added. Extreme CS values need attention for possible pullbacks. Those will now show in bold font. + "Label font 2 (for extreme values)"
Pixel size and height of sub-window and dashboard blocks will now auto-fit to a big screen like 4K. This feature will be disabled if Font spacing Y is not = 1. The sub-window height will not be fixed if "autofit pixel 4K" is set to false. 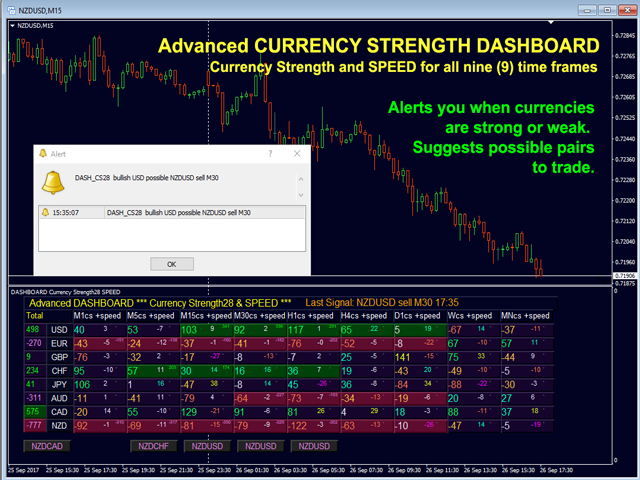 This updated dashboard version has now also been coded to print each currencies strength individually. The character of a currency is what makes it act differently to another currency. Currency pairs have many characteristics. We have created a proprietary formula which takes account of this characteristic and many people believe it is the first of its kind in the Forex world. Therefore we can say each currency is handled on its OWN characteristics! Improved visual display, especially for large monitors (4K).